This reusable plastic kids cup with lid and curly straw is the perfect addition to any kids themed menu at your restaurant! The combination of fun graphics and bright colors will grab the attention of your younger patrons and help keep them entertained while they wait for their meal. This eye-catching BPA free cup comes with a kid-friendly straw for easy use, while the crazy straw design will delight kids with its curly shape and fun appearance. The accompanying bright red lid has a straw slot and snaps tightly onto the cup to help reduce unwanted spills. We really like these kids cups. The curly straws are a great touch which kids love! They are just as durable as the cups we used to purchase for twice as much! Totally Love these cups they are the perfect size and the kids love them and their crazy straws. NO MORE SPILLS!! They are time and money all in one product. Perfect size and design for my kids!! The cartoon-ish design and silly straw make my kids' meal times on the go enjoyable. I sometime have these drop in my car too and haven't had a serious leaking issue. These souvenir cups are fun and colorful. They are a great size for kids! I expected them to be a little sturdier but they work fine for cold drinks. These cups are great my kids use these every time we leave the house to go out somewhere and throw them away when there done. I don't see why restaurants charge so much for these cups. The price of these they should nearly give them away for free. There is nothing wrong with these cups other than shipping. Most food providers sell these too for about the same cost and it doesn't cost nearly as much to get to your restaurant. This will instantly stop any child's blues. Colorful cup. Seal tight lid. Fun straw to play with. The only problem will be keeping your servers away from them. I highly recommend buying these plastic kids cup with reusable lid and curly straws. This is a great price and the kids really love the design of this cup. Fun to give out at our restaurant. The kids that come into the restaurant love these cups! We actually get repeat business because the kids just want to come back to get cups. AND they are reusable! The cups are adorable and surprisingly durable, kids love these and the bendy straws fit well. The lids are a little tricky to put on but not imposible or too difficult. The lids are very secure and are pretty accident proof. We absolutely love these cups for the kids at the restaurant. You actually save on drink cause kids dont drink all tou give them in our regular to go cups. Great kids cups with cute pictures on the sides. It comes with fun colorful bendy straws too! However, the lids can sometimes be hard to snap on but for the price a great deal. It's also nice that the lids and cups can be washed and reused. These plastic kid cups are amazing. They work great and hold drinks with out any spills. The kids enjoy how fun they are. I highly recommend. Our littles love these cups!!! We have been using them for 2 years. The straws are long and can be bent into squiggly shapes!! Better order 4 cases at time!! Durable and easy to put the lid on. Kids love the flexibility of the straw to play with and keep them occupied at the table. These cups are nice and sturdy. the pattern is vibrant and cute. The Kids love them! The lids go on tightly and do not pop off easily. And the straws it comes with are disposable curly straws. These are great cups. Kids think they are cute. They love the curly straw touch. The lid is a huge lifesaver because NO MORE SPILLS! This kids cup reduced the cost for kids cups on property by 50 percent and they are the same if not better quality all the way around. Fun and kids love the straws. Servers have made a game of letting kids choose their colors. Have held up well and we are already reordering! Would recommend for any family-friendly restaurant. Purchased these for my child's birthday and they were a hit. I used them as a gift bag and everyone loved it. Great kids cup. Love the price and the amount you get for that price. I have plenty more to use for my next child's birthday party! Lid seals onto these cups securely. Tips over and doesn't spill! Great for all our tiny diners in house and to-go. They love picking out their straw color. Purchased these cups two separate times. The first time they would have gotten a 4 star rating but I dropped it to 2 because of the lids. The first time around they would go on tight with some difficulty. The second order came and the lids are almost impossible to put on, causing spills from the force of trying to close them. They seem to be slightly smaller then the cup opening. Love these! The kids love them, they are perfect size for our kids menu drinks, priced well and I would reorder this item again once we run out. This product is the perfect size for children and has a cute design on the side for entertainment. The lid locks securely to prevent any spills from the unit and the goofy straw makes drinking fun for children. These plastic kids cups with lids and straws are a nice reusable cups for any restaurant. Keeps your kid customers happy with these fun cups. Kids love these cups! They are super fun and the curly straws are great. The cups themselves are very thick plastic and the lid seals tight. We are on our 3rd or 4th case, we love these, they store well & easily and work perfectly for kids in our Game room- I love the colored, fun straws because they help tell kids drinks apart, also easy to write on with a sharpie in larger groups of kids! really good cups for kids when they order of the kids menu. Has a special line to write down the child's name. The straws come in many colors and they are bendable. so they can have fun with them. Awesome design on them. Really easy to stack them and the lids. the straws have a plastic cover on them that way they don't bend as you carefully place them on a container. We find these are great cups to use for our kids meals. We are a music themed restaurant so we love the music cups! Kids love choosing the color of their straw! The kids love it when we come out with these plastic kids cups. its averages out to .07 per cup and because it has a lid, no spills on our carpet. The curly straw that comes with these cute little cups is such a nice and unexpected touch. Who doesn't love a curly straw? Monsters... that's who. Cup, lid, and straw in one! Easy and convenient, cute design and curly straw, perfect size, tight fit. BPA free and dishwasher safe so your customers can take it home and reuse it! These are perfect as an addition to a children's menu. They are reusable and this lead seals on pretty decently. Kids seem to enjoy these cups. These cups are a great reusable kids cup set . Comes complete with lids and bendy straws. Straws come in a variety of colors and lids fit securely. Great product for any restaurant. This is just what I was looking for. The cup is a perfect size for children and they love the curly straw! Strong plastic material. Buy with confidence. 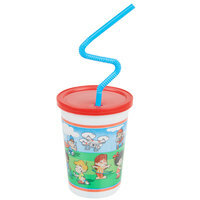 Great cup for kids and easy enough to handle - and kids absolutely LOVE the crazy straw. Everybody wants to take these home and reuse them. Not happy with these cups. Lids are a pain to put on but we go through so many so fast that we used them up. If the issue with the lid was fixed we would reorder. Kids really love these cups - especially the straws. It is a bit of a stretch to call them reusable. It is technically true, but in a restaurant setting most cups will not see more than 2 turns.